Set your DVRs for August. 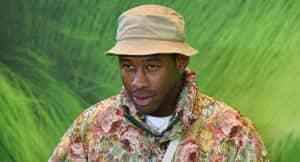 Viceland has confirmed a report that came out last Friday about the possibility of Tyler, the Creator getting his own television show. According to Deadline, Nuts and Bolts is officially on the network's slate for this summer, and will premiere on August 3 at 10:30 p.m.
On Tuesday, Odd Future tweeted out a picture with all the pertinent details: name, premiere date, time, and channel. Viceland promptly retweeted the account. Per an earlier report, the show will follow Tyler while he finds out "how things are made." The title is the same as a series originally developed with GOLF Media. Also coming to Viceland is a television show from Diplo called What Would Diplo Do? It will be the first scripted show for the network, and will feature James Van Der Beek playing a fictionalized version of the DJ. Diplo and Van Der Beek are executive producing the show, which also premieres August 3. Thumbnail image via Mark Peckmezian.